Summer’s So Close I Can Taste It | Food E.
I’m obviously a girl who loves her sweets. But there is a sweets subcategory that always gets me: fruit. I love a good peach pie, or a lemon raspberry cake, or even an apple baked with sugar and cinnamon. Now that summer is waving at me from just a few short months away, I’m thinking lemons. 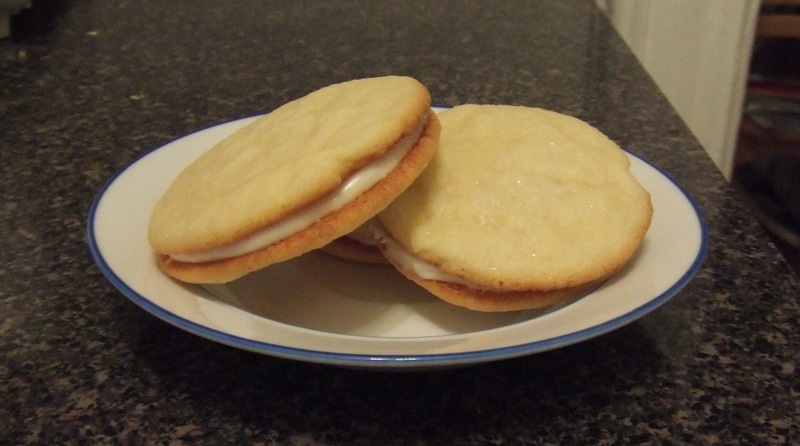 And since I’m always thinking dessert and I’m always thinking cheese, what came out of my brain were these deliciously light, crispy lemon cookies with a smooth, creamy center to round it all out. Preheat oven to 375 degrees. Bring lemon juice to a simmer in a small saucepan over low heat; cook until reduced by half. Add 1 stick butter; stir until melted. Cream remaining stick of butter and 1 cup sugar on medium speed. Mix in egg and lemon butter. Mix until pale, about 3 minutes. Mix in vanilla and zest. In a separate bowl, whisk together flour, baking powder, and salt. Combine dry ingredients with wet ingredients and mix completely. Refrigerate dough for 30 – 45 minutes. Pour remaining 1/2 cup of sugar on a plate. Roll spoonfuls of chilled dough into 1 1/2-inch balls; roll them in sugar. Place 2 inches apart on baking sheets. Press each with the flat end of a glass dipped in sugar mixture until 1/4 inch thick. Bake until just browned around bottom edges, 8 to 9 minutes. Cream together both cheeses, butter, and powdered sugar, adding milk if necessary. Add lemon zest and vanilla. Mix well. Spread 1 Tbsp of filling between two completely cooled cookies. Refrigerate sandwiches until ready to serve. Note: if you’re serving these for guests, make sure you refrigerate at least one hour before serving so the filling firms up completely. Pingback: Happy Valentine’s Day! | Food E.